For the 90th anniversary of Winnie-the-Pooh, a sequel featuring new stories and a new character from the Hundred Acre Wood. 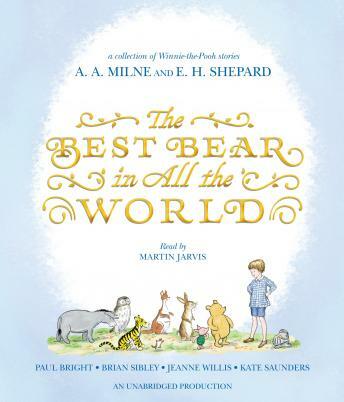 The Trustees of the Pooh Properties have commissioned four authors to write in the timeless style of A.A. Milne to create a quartet of charming new adventures for Winnie-the-Pooh, Christopher Robin, and their friends. Winter, Spring, Summer, and Fall: take a trip back to the Hundred Acre Wood with a collection of tales sure to delight year-round. One story finds Winnie-the-Pooh and Piglet on a quest to discover the 'Sauce of the Nile' (they suspect it's apple). And in another, all the animals rally around poor Eeyore when he thinks he sees another donkey eyeing his clover. The winter story features a new penguin character, based on a stuffed toy owned by Christopher Robin Milne himself. Readers of all ages will love rediscovering old friends and making new ones in this essential new volume of Pooh stories.